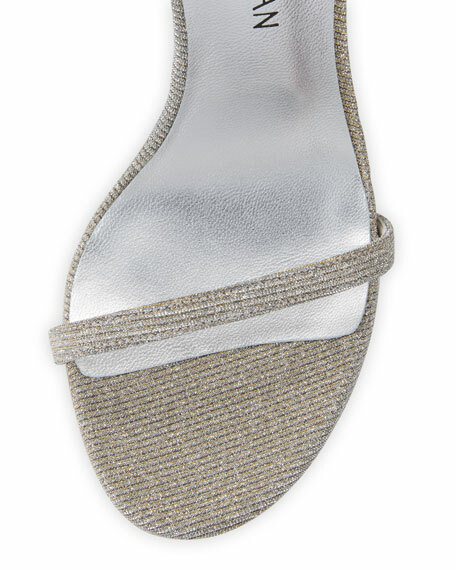 Stuart Weitzman shimmery fabric sandal. "Nudistsong" is made in Spain. Gianvito Rossi mirrored metallic leather sandals. 4.1" covered stiletto heel. Strap bands open toe. Layered crystal ankle straps. Secured with lobster clasp. Leather lining and sole. Made in Italy. 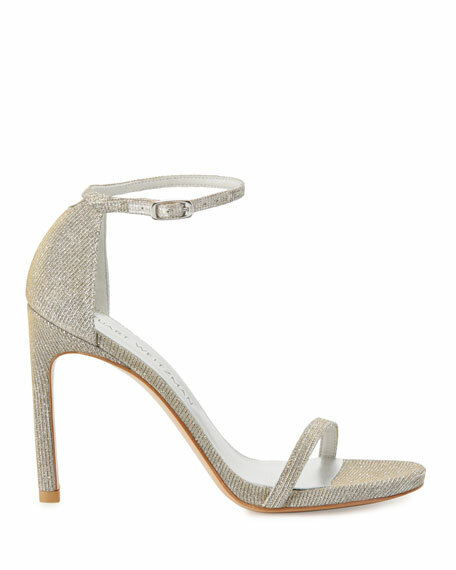 Gianvito Rossi double-band suede sandal with buckle detail. 3.3" covered block heel. Squared open toe. Slide style. Leather lining. Smooth outsole. Made in Italy. Saint Laurent speckled metallic leather sandals. 3.3" covered stiletto heel. Square-cut open toe. d'Orsay silhouette. Adjustable ankle strap. Leather lining and sole. "Amber" is made in Italy. Fit note: Saint Laurent shoes run small. Please order a 1/2 size larger than you typically wear.